In chess, the chess piece relative value system conventionally assigns a point value to each piece when assessing its relative strength in potential exchanges. These values are used as a heuristic that helps determine how valuable a piece is strategically. They play no formal role in the game but are useful to players, and are also used in computer chess to help the computer evaluate positions. Calculations of the value of pieces provide only a rough idea of the state of play. The exact piece values will depend on the game situation, and can differ considerably from those given here. In some positions, a well-placed piece might be much more valuable than indicated by heuristics, while a badly-placed piece may be completely trapped and, thus, almost worthless. Valuations almost always assign the value 1 point to pawns (typically as the average value of a pawn in the starting position). 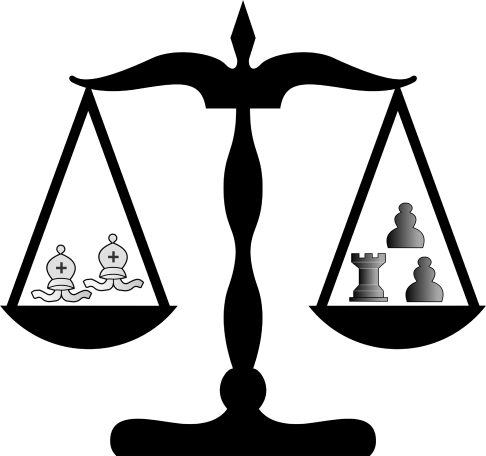 Computer programs often represent the values of pieces and positions in terms of 'centipawns', where 100 centipawns = 1 pawn, which allows strategic features of the position, worth less than a single pawn, to be evaluated without requiring fractions. King = Between 41 and 200 points - this varies from computer to computer, but it needs to be large enough so that it isn't exchanged off by mistake. trey this ahmed in 5.2 this has helped in the t55a for me. can you tell me What is the better materials values for ivanhoe ? The Kings endgame capabilities are considered to be slightly stronger than an bishop. Commoner is notably stronger in practice than a minor piece. This is a very short-range and very flexible piece that is much weaker than a Knight in the opening, very strong in the middlegame if it can occupy the center, and almost always wins against a Knight or Bishop in the endgame. The weakness of this piece is that it takes a long time to get from one section of the board to another; for example, in the opening, it takes 2 or 4 moves to get a WF properly developed. Its strength is that it concentrates a lot of striking power in a small area. The bishop pair has an average value of half a pawn. When the side down the Exchange has the bishop pair, my data shows he needs only 1.15 pawns to make things even. Quote wrote: In the middlegame the two bishops should be employed as actively as possible in the attack on the king. But the bishop pair is also very valuable in the endgame. It is possible with a deliberately planned exchange of one of the two bishops to transpose to an advantageous endgame such as ‘bishop versus knight’ or ‘good bishop versus bad bishop’. " @John Nunn wrote: A bishop and knight normally beat a rook if pawns are equal, but considerable work may be required. The attacking side must aim to fix the enemy pawns, so that the two pieces can simultaneously target them. @John Nunn wrote: On the other hand, a rook and two pawns are worth more than a bishop and knight in the ending. This is a relatively favourable case for the pieces, as the pawns are pretty much on one side of the board and the d-pawn is weak. However, accurate defence is necessary. Black never has time for ....Bd4 and ...e5. Quote wrote: Never be satisfied with the placement of your pieces. If you see a better square for one or more of them, look for ways to get the piece there; and mainly, use your imagination. Steve Mayer wrote: The bishop pair is also very capable of compensating for a material deficit; it is, e.g., well-known that in open positions the bishop pair combined with a rook is stronger than the combination of two rooks and a knight. The superiority of the two bishops can also be seen in the struggle against other minor pieces, that is to say against a bishop and a knight or against two knights. @John Nunn wrote: Two knights are the worst combination of minor pieces when fighting against a rook. A Knight without advanced posts is inferior to an active Bishop. Don't let the enemy Knight find a good square! obstacles and treat that Bishop to wide-open diagonals! Let us draw some initial conclusions - the bishop-pair can be a huge strengt but only when coordinated and only when their diagonals are not doggedly blocked by pawns for considerable lenght of time. As the rule goes, the more space the bishops have, the more effective they become. @John Nunn wrote: It is well-known that two bishops are better than a bishop and a knight in open positions. However, the same is true in many semi-open positions. This exiting game shows the power of the Bishop Pair and it's capability of compensating for a material deficit. Steve Mayer wrote: Few attacking forces are as powerful as a pair of active bishops. A pair of bishops is usually considered to be worth six ‘points’, but common sense suggests that a pair of active bishops must be accorded a value of almost nine under some circumstances. It should come as no surprise that it often proves fruitful to sacrifice a pawn or even an exchange to activate a bishop pair. I would have thought the value of pieces all depends on the postion, sometimes the pawn can be as powerful as a Queen. @stagehand wrote: I would have thought the value of pieces all depends on the postion, sometimes the pawn can be as powerful as a Queen. If the bishop pair is equivalent to rook and two pawns, i belive it's natural to assume BBP to be equal against RN. For some reasons the RN side have a slight to trivial edge. "In the endgame it is sometimes not clear which of these combinations of pieces is the stronger. 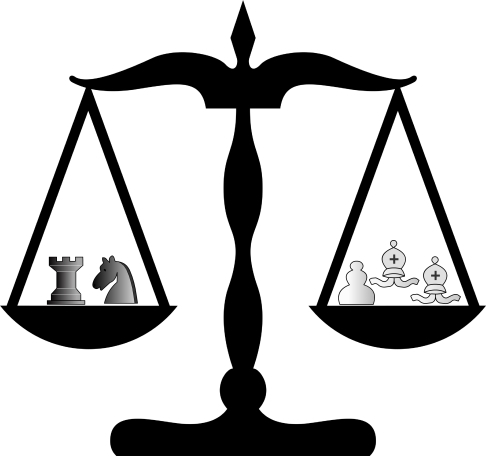 It generally depends on the other material or on positional factors"
The knight is a combinative piece and therefore seeks middlegame complexities, whereas the bishop prefers endgame simplicity. Hence exchange and simplification, reducing the tactics and bringing the edngame closer, are farouable to the side possessing the bishop-pair. The power of the two bishops noticeable increases as the quantity of pawns and pieces on the board disminishes - in other words, as the endgame approaches. Definition of trifle "something that does not have much value or importance"
"With other things the same" or "other things being equal or held constant"
"...At the same time, two knights frequently face problems fighting against a rook. The rook has a much more complicated task when playing against a knight and a bishop." My implication says that two knights is the worst minor piece combo versus single rook.